Bomb Chicken. A chicken who, instead of eggs, lays bombs. Those big shiny ones that look as if they were manufactured by ACME. The chicken uses them in a myriad of ways, though not always to explode things. The chicken can’t jump – it’s a chicken, so it can’t fly, either – so the bombs are also used to scale heights and press distant buttons. Of course, this is all rather silly, so it’s bolstered by an equally bonkers story which sees the chicken attempting to escape the slaughterhouse after the egg it hatched from was coated in some blue goop. The plot is a cross between Ninja Turtles and Abe’s Oddysee – which is tremendously stupid and entertaining. But, we’re not here for the story. We could be here for the visuals as, for once, the pixel graphics aren’t just used as a gimmick. They’re genuinely pretty to look at, bursting with vibrant colours and tiny details. The design is outstanding, from the enemy design to the movement of Bomb Chicken, every tiny feature from animations, to background scenery is oozing charisma. Admittedly, the game relies a lot on environmental tropes we see in so many titles – sewers, underground tunnels – but even so, they’re created with flair. At one point, you’ll reach a room that resembles a temple, complete with a large monument chicken God. This is because, along the way, you’ll collect blue gems, which can be traded with the chicken God for extra heart containers. These hearts then act as retries for sections of the levels, rather than generic lives. Die, lose a heart, but start from the screen you died on. Lose all of the hearts and you’ll need to restart the entire section. It’s not so bad, because the puzzles remain clever throughout and even when they require quick reflexes, they’re generally exciting. Some levels require buttons to be pressed either with your large chicken bottom, or by kicking a bomb down a tube to hit the switch. These open doors, which lead on to other rooms with more puzzles or scatterings of enemies. If anything is generic about Bomb Chicken, it’s the mechanics, as we’ve seen this sort of thing done before. But it gets a pass, because it utilises things we’ve seen before but wraps them up in a comic style. Certain rooms require some platforming, but of course, no jumping means that you must lay a tower of bombs to reach certain points – either high ledges or maybe you just need the height to clear a spiked pit. This adds an element of danger, because, of course, bombs explode. The juggling of kicking bombs to defeat enemies, stacking them to open secret tunnels or reach Mario style warp pipes, is sometimes a little routine, or knife-edge stuff. A late level sees you having to outrun a spinning saw blade, Meat Boy style, by stacking bombs, pressing buttons and all against the ticking clock of death. 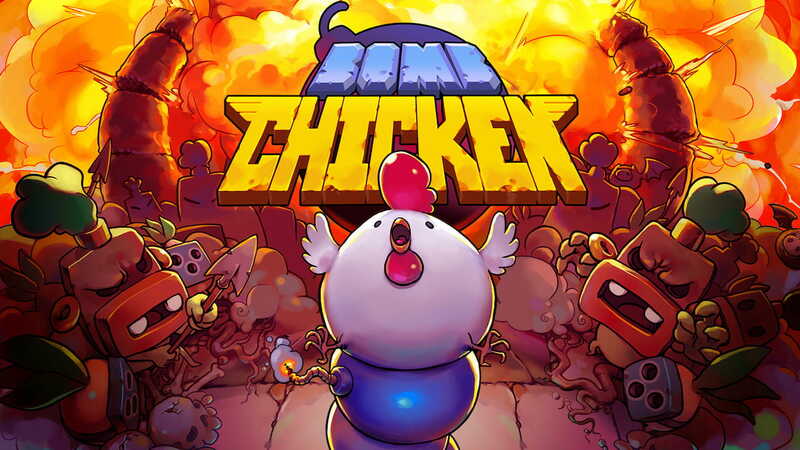 So, while the design falters in some places by seeming a little too familiar, Bomb Chicken is thankfully bolstered by some edge of the seat moments where the design can only be applauded. Any moments of sheer frustration are generally found in a lack of timing, rather than unfair enemies or by learning patterns in metal presses that would otherwise squish you to a pulp. It’s a one-time play, there are no unlocks to grab, no need to hunt down collectibles and the game is better for it. Things are kept simple, stylish and for a lot of the time, funny. It’s worth playing for the puzzles, it’s worth playing for the style and mostly, the animations.